Our Esox Tiger Tail is an outstanding lure that can be used to catch trophy northern pike and giant muskies. 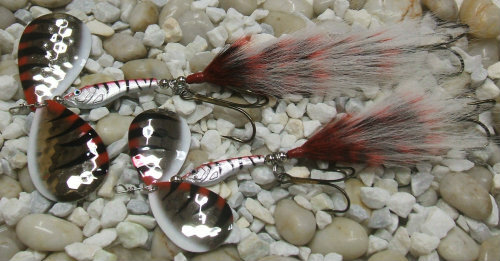 The high contrast painted blades and tail combinations catch the fishes eye and trigger them to strike. The unique fish shaped body weight increases visibility while adding extra weight to cast longer distances. It also keeps the lure deeper for fast burning retrieves. This lure can be used casting or trolling.